The original on-screen model for Star Trek’s USS Enterprise is back in action—as much as being on display in a museum can be “action” for a spaceship. But after a long process of restoration, the ship has finally been made available for public viewing again, just in time for the show’s 50th anniversary. Following the end of the original Star Trek, the Enterprise model has had a bit of a miserable life. The ship spent many years hung from the ceiling after being donated to the National Air and Space Museum, which heavily damaged its structure. In the 1990s, in the wake of Star Trek’s resurgence in popularity, the museum “restored” the model, adding extra lights and detailing that wasn’t present on the original ship. It was eventually resigned to display in the museum gift shop in 2000, to avoid even further structural damage. Not exactly a stellar career for what has become one of the most iconic spaceships in popular culture. The “restored” Enterprise’s resting place between 2000 and 2014. Eric Long, National Air and Space Museum, Smithsonian Institution, via Air and Space Magazine. But in late 2014, the museum announced plans to recorrect the damage done to the Enterprise over the years—a re-restoration project to undo the former restoration, bringing the model back to its original on-screen form. Finally, nearly two years later, the process is complete. 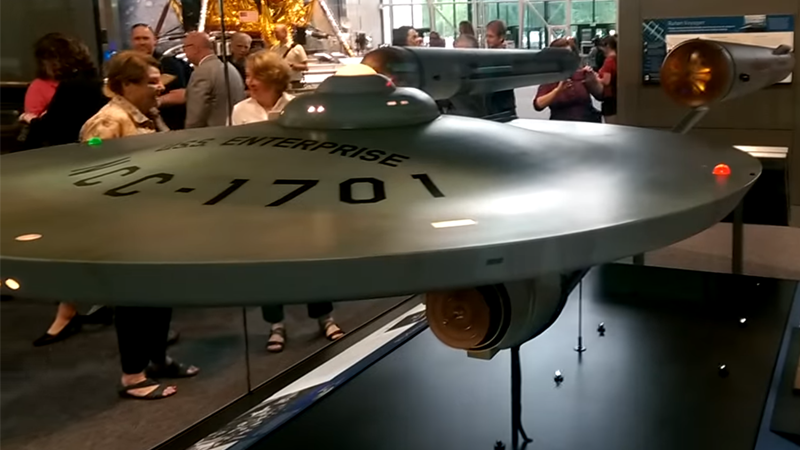 The Enterprise was unveiled in its new home in a climate-controlled display in the museum’s Milestones Exhibit on July 1. Now, for the first time in decades, fans can see the model as it appeared on television 50 years ago. Check out a video of the Enterprise in all her glory courtesy of TrekCore below, and see more of the restoration project at the link.